Professional Green Straight Line Laser, ultra-precision grade for professional leveling, alignment, adjusting, positioning, measuring and targeting device. Wave length: 532nm. Laser line accuracy: 20" (+/- 1mm @10m). Emitting angle: > 120°. Output power (Center) : Class II - less than 1mW. 2.7~3.3 VDC operation. Dimensions: D13 x 70 mm. Green Line laser. 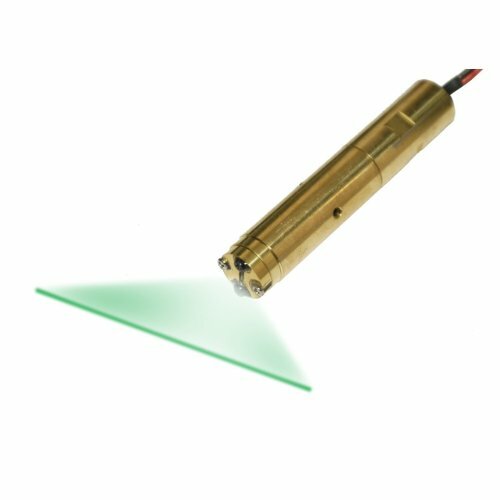 The best line-accuracy and the widest emitting angle Green line laser module for use with high-precision devices. This module has integrated quartz cylindrical lens, collimating lens, laser diode, and APC driver circuit. APC driver circuit enables constant Laser output power. Includes patented solid brass structure for the best shock resistance and better heat transfer consideration. Multiple glass lenses Lens and Quartz Cylindrical Lens provides Line Laser.